Are consumers more loyal to banks or large companies such as Apple and Google when it comes to their money? Future ambition is rarely found by looking inwards. The motivation for driving growth and change comes from competition and a desire to win. Understanding the competitive threat and the way in which new technologies can enable and accelerate change is best found by working with innovative thinkers. When it comes to retail banking, those thinkers are often the consumers themselves. Customer needs are changing, younger people are more willing to switch to embrace an improved service and there are plenty of new challengers out there ready to give them the experience they’re looking for. How do we know? Well, apart from gut feel and personal experience, Peru Consulting asked 1000 consumers and 100 Senior IT Leaders in the banking sector. The results, published in our report - Retail Banking IT: Turn to Face the Change – offer a startling insight into the scale and speed of change and the challenges faced by traditional banking’s IT leaders. For example, when asked about the specifics of banking transactions using mobile phones, nearly two thirds (63%) of consumers in the 18-44 age group stated this was important to them, while only 14% of the 55-64 age group felt the same. More generally, the next 12 months holds little comfort for the retail banks when it comes to customer loyalty, with 38% of 18-24 year olds and 41% of 25-34 year olds set to change the bank that provides their main account. It is clear that new providers are offering improved services and making the decision to switch ever-easier and there is no question that, in order to survive, the legacy banks are going to have to respond – and fast. A recent list identified 55 challenger brands offering retail banking services from Abacus to Zopa. For example, Monzo, which has recently been awarded a banking license, has a mobile app that helps you manage your budget by categorising spend by ‘groceries’, ‘eating out’ and so on. It also lets you add your receipts to your purchases, and notifies you after every purchase. 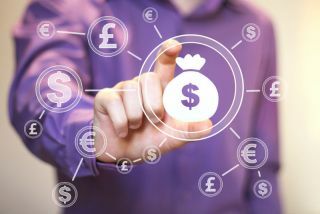 Revolut is another newcomer which enables peer-to-peer lending, allows you to spend and transfer in multiple currencies without fees, and also categorises expenses. Both services take minutes to set up on your phone. The opportunity has not only been recognised by the bright young things in the industry. Seasoned banker and former CEO of Barclays, Antony Jenkins, has launched a new venture called 10x that promises to offer banking that is ‘diverse, open and fair’. Peru’s research didn’t just look at the current crop of challengers, it also considered the potential impact of the non-banking digital giants if, or perhaps more likely when, they decide to join the fray. So we asked consumers about Google, Amazon, Facebook and Apple (GAFA) and why they might consider switching to one of these as a banking service provider. Their response was clear, with three main attractions. They are likely to offer better products and services. We asked the Senior IT Leaders why they though their customers would be likely to switch banks. Strangely, while 64% recognised that challenger banks are taking their market share, less than 5% recognised that customers might be tempted by new technology such as mobile apps. Given the strength of the GAFA companies and fintechs, this is a dangerous blind spot for the traditional banks. It’s clear that sooner or later traditional banks will have to respond. The question is how fast can they do it? Business leaders are being forced to consider their options, including the development of new propositions, acquisition of innovative businesses and creation of startups. As customers look elsewhere for their services there will be increasing pressure on the bottom line too. CIOs and their technology teams can wait and respond to the inevitable changes or they can lead the business in driving change. IT Strategy is critical to providing clarity and is a guiding star for technology teams and stakeholders alike. It should be aligned to the Business strategy, the needs of customers, and the needs of key stakeholders. However, leading CIOs have the power to inform business strategy and its execution through a strong understanding of technology trends and a clear view of the investment and capabilities required to enable the ambition of the business. Innovation is often technology-led and yet, to realise the potential, there needs to be strong engagement with product and marketing teams. For this reason, it is paramount to work collaboratively across business and technology teams to ensure that the options and priorities are clear. It is just as important to understand the innovations first hand. There is no substitute for subscribing to competing services to better understand the customer experience. Of course, it is just as important to regularly experience your own products, testing out each of the customer journeys to truly understand how they can be improved. The combination of business alignment, customer insight and capability assessment enables the production of a clear roadmap over a realistic timeframe that underpins the strategy. Peru Consulting has proven this time and again through its IT Strategy Development process, delivered with clients across the banking sector. If the roadmap defines the journey that the organisation will take to deliver the business and IT strategy then it is as important to understand the starting point as it is to understand the destination. It is surprising how many teams charge energetically towards the destination and find themselves constrained by limitations in systems, network, processes or capability that could have been anticipated with proper planning. Architecture and Technology reviews at the outset often form a sound platform from which to move forward. The best teams will also actively understand and manage risk as an inherent part of delivering the plan. This shouldn’t be seen as a separate activity, and active management requires a greater focus than documenting the risks and mitigations in a folder, to be reviewed just before the next audit. Continued engagement with business stakeholders and customers through focus groups and user groups enables continual checks and balances throughout the delivery of any change programme. Agile software development inherently enables this iterative approach and, if executed in a disciplined manner can improve business outcomes. So can the traditional retail banking sector turn the ship fast enough to combat the winds of change? A clear IT strategy will certainly help to give teams a clear and aligned purpose that can be easily communicated and is well understood by all stakeholders. But it needs to be built upon an understanding of what the customer wants and expects. Products and services, and the way are delivered, need to be developed accordingly. It is then a matter of delivering the roadmap and maintaining a clear scorecard that tracks progress in a transparent and visible manner. The pace of change can catch out even the largest organisations. Nokia and Kodak are just two examples of previously world-beating corporations gone awry due to fundamental misunderstanding of the direction of the market. It is easy to feel overwhelmed by the increasing demands of legacy estates, changing regulation and relentless security threats. However, for the retail banking sector, there has never been a better time to rally the team around a clear and focused strategy that will give consumers, and the business leaders, what they want. Readers can download the Peru Retail Banking IT Report ‘Turn to Face the Change’ at no cost from the Peru Consulting website.